For many French Canadians today, even those born through the 1970s, growing up in large families was not an uncommon experience, due in part to adherence to the tenets of the Catholic church. Human nature being what it is, individual experience within large families is varied. In this contribution by Jesse LaForest, we encounter a range of experiences, with an emphasis on family ties and faith. And we see how traditional pursuits such as hunting and trapping, practiced by French Canadians in the region for centuries, continued on into the 20th century––ed. LaForest brothers, near Bay City, Michigan, circa 1962. Jesse LaForest on the right. Sometimes life goes by so fast that we forget the really important things – like family. I grew up in a family of nine children and can vividly recall life with my siblings. They were not all good times. With nine children that is to be expected, but for the most part we did pretty good. Mom was one hell of a cook and had to cook for her army daily. Dad worked and it seemed like that was all he ever did. With nine children and everyone else that was over to the house, there were a lot of mouths to feed. That was often between 20 to 30 people adding in friends, aunts, uncles and cousins…it was like a party! I remember the times we five boys would find things to do. We grew up on 20 acres on Wheeler Road in Bangor Township near Bay City, Michigan. 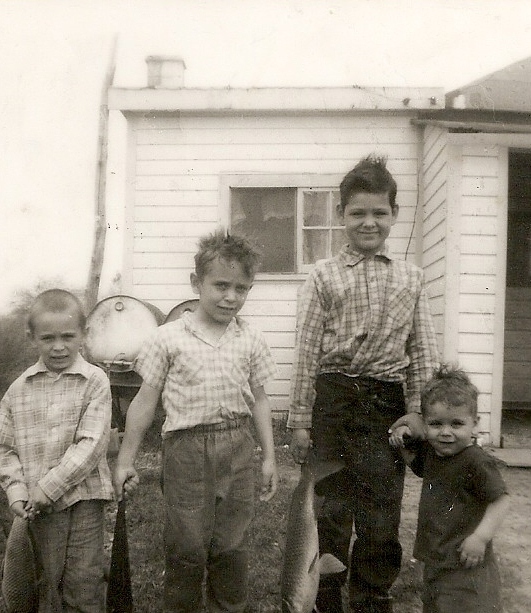 We, as boys so often do, loved to hunt and fish, although we never took more than we could eat. We also enjoyed trapping and frogging. We would get frogs almost on a daily basis walking the ditches of Bangor Township. Man, our sisters hated that! We would bring home a few dozen bulls, skin them babies and fry those legs up in a little butter and onions – pardon the cliché but they did taste like chicken. We also went down to the Dow Corning hot ponds. Back then there were no gates (call that a privilege of growing up in the 70’s.) We trapped muskrat and sold the pelts ­— we typically got $5 to $10 from a local guy. Nah we did not get too many but we had fun out running around. Some of the best times I can remember were (well OK I won’t tell my children this) skipping school and walking down to the river by the Bay City Yacht Club and fishing all day long, falling to sleep on the bank with the sun rays gleaming down. When we weren’t frogging, hunting, or trapping we played a lot of games which got our creative energies going. Dad was creative as well. I remember a time when we were into darts. Dad taught us how to make our own with needles from Mom’s sewing kit. Mom was not happy about that at all. We had a ball until, of course, one of us decided the board was not good enough and that it would be more fun to throw them at each other! And boy did we – until Mom said enough was enough and gave light to the old saying “it’s all fun and games until someone loses an eye” and put an end to it. An old song I remember by country singer Sonny James called My Woman, My Wife, reminds me a lot of Mom and how much she sacrificed for us kids. In the end though she just had to live life for herself. Raising nine kids is a chore and when the baby was 16, Mom and Dad split. It was tough on them both. But they had a good go at their marriage starting as teenage lovers. After the divorce Mom met a Canadian guy working at the Midland Nuclear Plant. She married him and moved to a little town in Canada. She opened a craft shop and treasured the times we would visit. Mom is gone now – she died back in 1998 and all nine of us kids were with her when she passed. I know I haven’t mentioned this but we were a Catholic family and if I ever had a doubt that GOD truly existed Mom showed us all in the end, in a very special way, that he truly does. Dad, he’s still with us. He’ll be 85 this year. He is a quiet man and still helps out when he can. He comes over every Saturday after church for a home cooked meal, plays his computer chess set we all got him and is enjoying the time he has left. He is simply the best man I have ever known. He is not a materialistic person at all. If it’s not a necessity he does not want it. I guess that comes from sacrificing for your children all those years. And probably also because he comes from a family of ten and grew up on a working farm. The moral of my little story is that life is short, too short for sure. Now I have children and grand children and I love each and every moment with them. Every chance you get, be with family and friends, don’t waste time on those that bring you down, spend the little time we have being happy and living life as it was meant to be lived. Great story! It is very similar to our family of ten, growing up on a small farm in Tower Michigan. Life was a bit simpler and a little slower back then for sure Mike, I am also certain that the majority of us LaForest are related in one was or the other through the LaForest of Peche Island near Detroit…. Thank you Jesse for your very nice and emotionnal story. The family’s story of the past are always interesting mainly that from the Michigan and Great Lakes. The past of this region in no enough known. You are very welcome Yves, I enjoyed writing it and recalling those very enjoyable summers, as we age we seem to drift from the family a bit but our memories are forever….. I love hearing the stories of my Uncles and Aunt when they where little rascals as I myself spent a lot of time at grandpa and grandma Laforest’s house us grandkids had a lot of great times playing in the big apple tree, marbles out side and it was really great when Grandpa put the pool in lots and lots of fun memories….